Excuse me, I'm cancelling all my plans to hang with my dog. There are two kinds of people in this world. Ones who live and die for their pets...and everyone else. Do I feed my dog leftover ice cream from a spoon and spend more money on his toys than my wardrobe? Yes and yes. Because he is a precious angel and HE DESERVES IT. It's a fact that no one loves us the way our pets do, which is why we're all for these products that honor them or allow us to spoil them. Pretty much a win for everyone involved. 1. 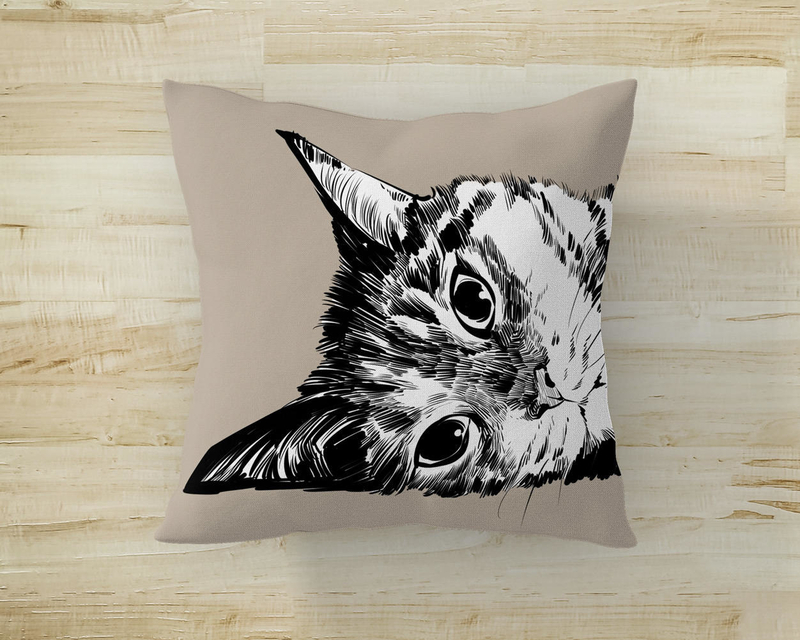 A custom-made pillow starring none other than your pet. Welp, I know what I'm buying my sister for her birthday this year. This plush pillow is customized to feature your very own pet! 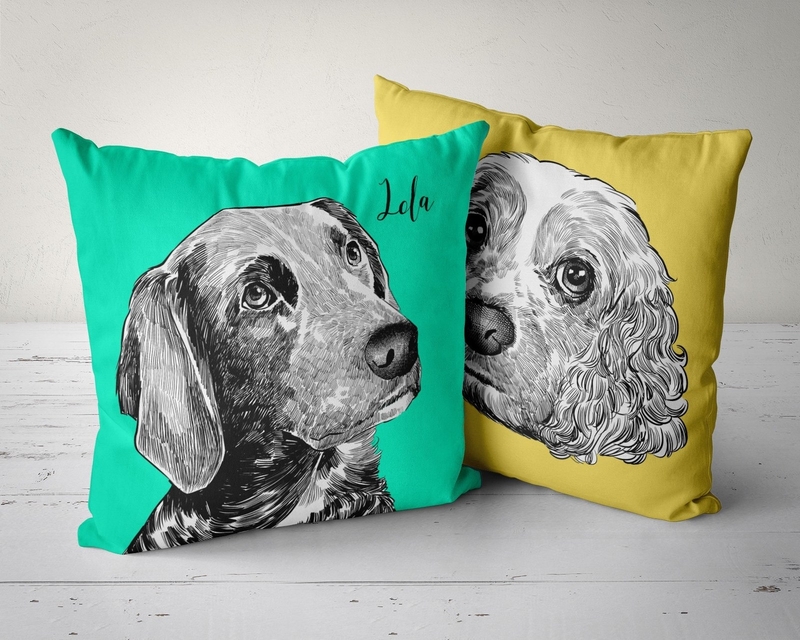 All you have to do is send the artist a photo of your pet, then they draw it and add it to a pillow! This adorable piece of decor isn't limited to cats and dogs — why not send a picture of your hedgehog or rabbit?! The pillow can be made in any color so it's sure to match your home. Obsessed. Get it from DrawYourPortrait on Etsy for $40+ (available in sizes 14x14-20x20 and in any color). 2. 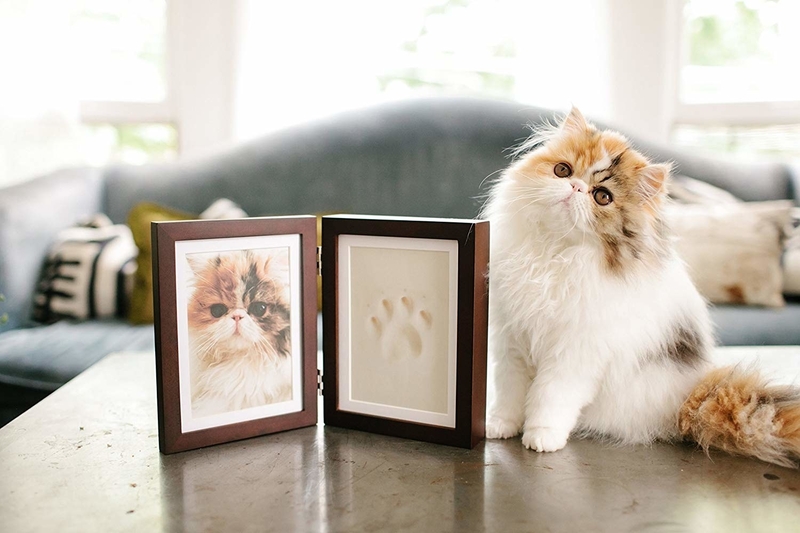 A picture frame that includes a replica of your furry friend's paw. Why don't I already own this? 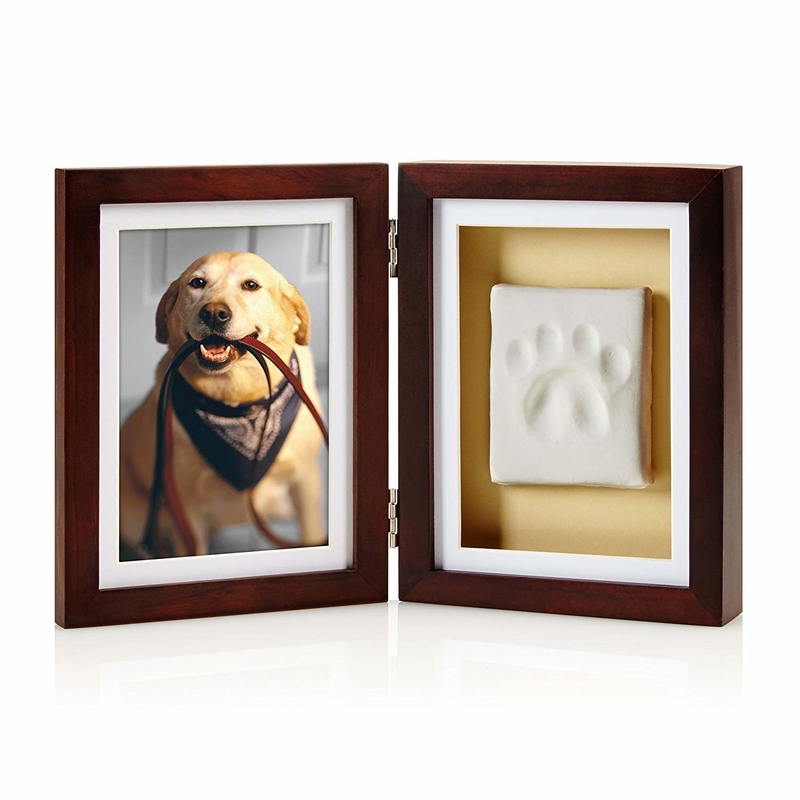 The frame comes with everything you need to create a lasting memory of your favorite creature's paw print. The impression is made out of clay (100% safe for pets) that air-dries, so you won't have to worry about making a mess. The frame itself is made with solid wood and holds a 4x6 photo. Get it from Amazon for $17.98 (available in seven styles). 3. 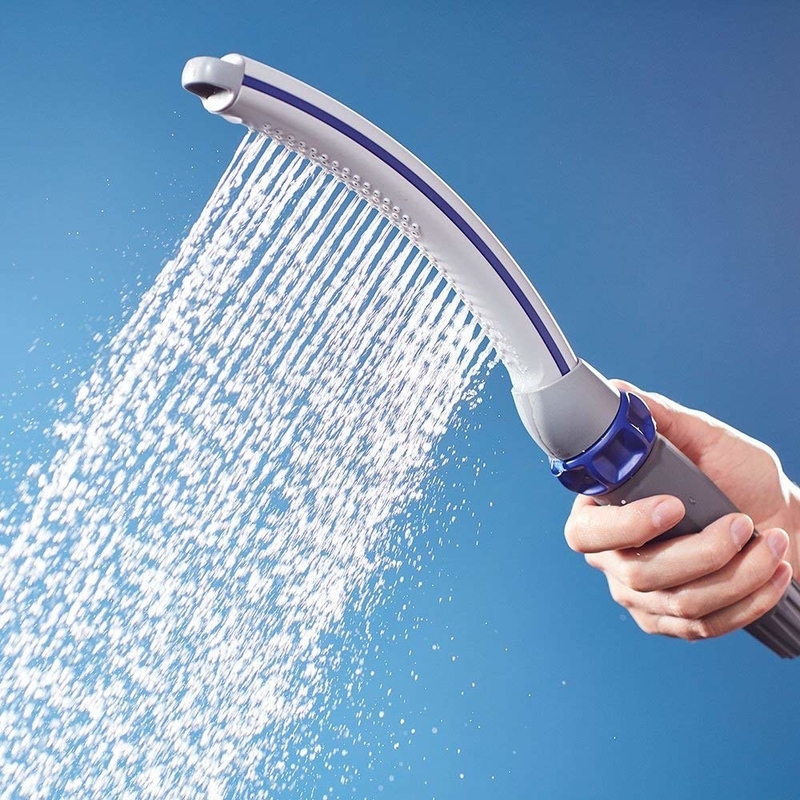 A handheld dog shower attachment so you and your pet can have a spa day at home. Who says a day of pampering should only be for us humans? 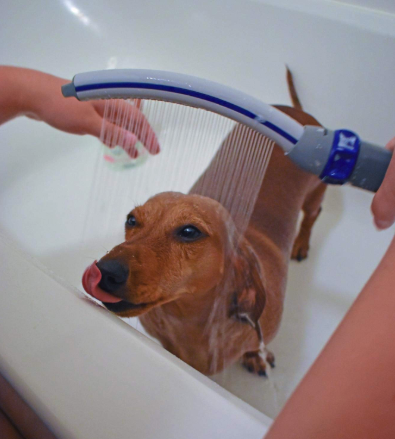 This easy-to-use pet wand will help you shower your dog with love (and water) from the comfort of your home. My dog personally hates the car, so taking all 80 pounds of him to the groomer is often a struggle (to say the least). By using this attachment he can clean up without feeling anxious. The unique wand is curved to provide full coverage while washing your pet. It also has an 8-foot-long flexible hose for extended reach and be used indoors or outdoors. 4. 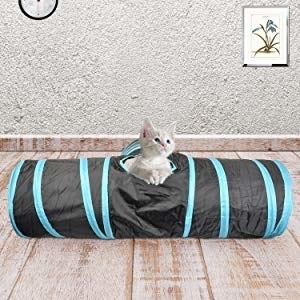 A three-way tunnel for endless adventures with your beloved furball. 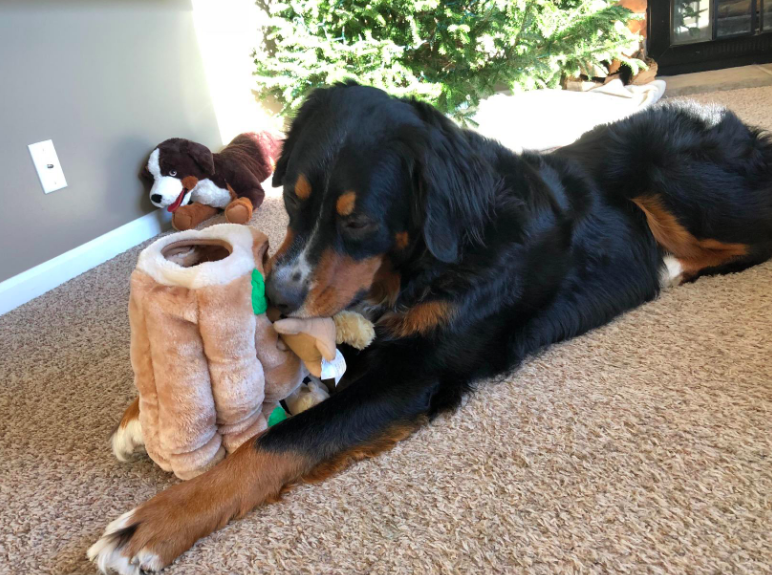 Ideal for puppies, cats, rabbits, and other furry friends, this is a toy you're definitely going to want to bring into your home. It includes three connected tunnels, built-in crinkle paper, a peephole, and a soft ball toy. It will give both you and your pal hours of enjoyment. It's made of durable, tear-resistant polyester and is framed with a sprung-steel. It's also collapsible and portable so you can take it with you to a friend's house. Get it from Amazon for $11.99 (available in blue and red). 5. A pet hammock so your pal can lounge in style on long road trips. Like I said before, my dog Luke HATES the car. He has full-blown panic attacks and someone always has to sit in the back with him to keep him calm. Not to mention he's a golden retriever and we end up with hair EVERYWHERE. But we love him and don't want to leave him behind, which is where this hammock comes in. 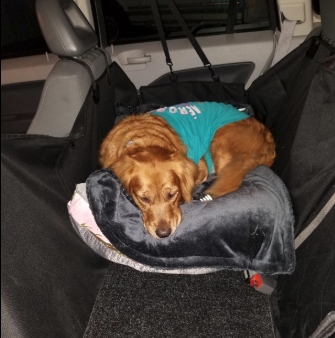 It can be easily installed in the back seat of any car, making dogs feel more comfortable while protecting the car from damage. This product is a game-changer. Get it from Amazon for $27.99+ (available in black and green). 6. 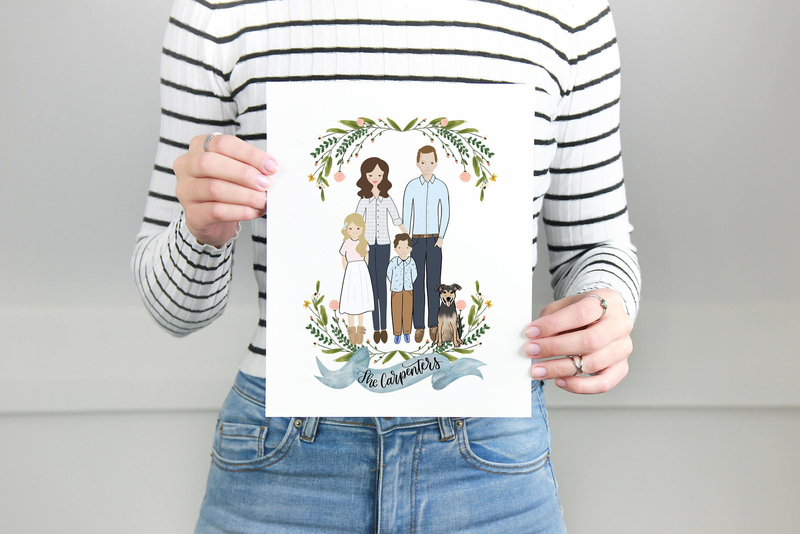 An illustrated family portrait that includes all of your pets and will make you smile every time you glance at it. Looking for the perfect way to show off your family? These hand-drawn illustrations can incorporate all of the important people (and animals!) in your life. I love how unique and special these drawings are — simply a must-have for those who love their pets. Available from PrintableWisdom on Etsy for $50+ (available in a variety of styles). 7. 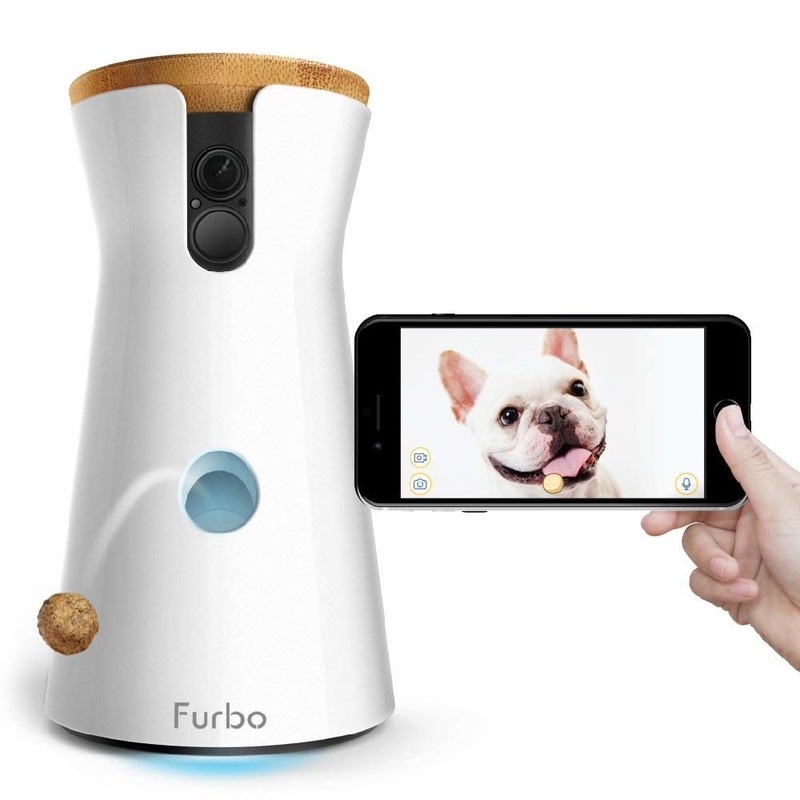 A dog treat camera so you can feed your little furball no matter where you are. The Furbo dog camera is actually life-changing. If you're in a long-distance relationship with your pet (like I am) or you're away for a period of time (or even just the day), it can truly hurt your heart to be away from your furry BFF. Thanks to this gadget, people like you and I can still feel connected to our pet! 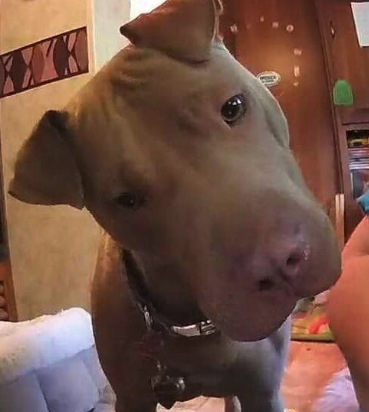 The camera allows you to see and hear your dog, talk to them, and to toss them a treat! It's amazing. Read our full review here. Get it from Amazon for $199. 8. A stain and odor eliminator that will keep your home feeling fresh even though you let your pet snuggle in bed with you every night. Rocco & Roxie Supply Co's professional strength stain and odor eliminator promises to remove stains and stinky smells with a gentle and safe substance. It can be used on all services — even litter boxes and kennels! If you don't believe me, check out one of the 6,744 reviews on Amazon and read our full review here! Get it from Amazon for $19.97 (available in 1 gallon size for $49.97). 9. 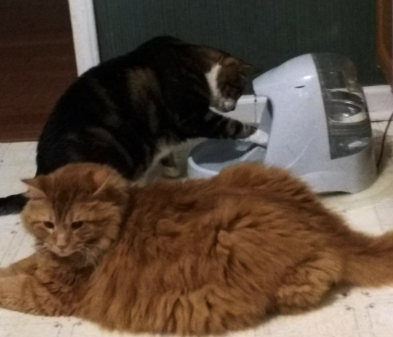 A fancy water fountain so your pet can drink to their heart's content (without begging you for more). Saying I'm obsessed with my dog is an understatement — but that guy wants water ALL THE TIME, usually when I'm in the middle of something. The guilt that a pet owner feels when they keep their furry pal waiting for just a moment is unmeasurable. This product helps prevent both of those issues! 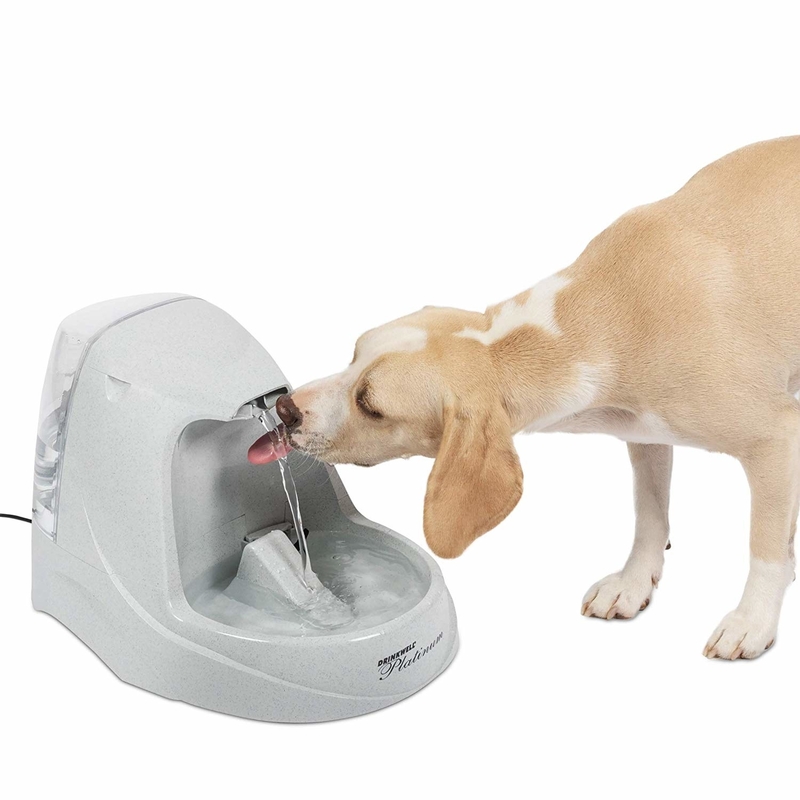 The free-falling water stream will allow your pet to drink whenever they feel so inclined, and encourage them to sip more often if they're usually reluctant to. Added bonus? It's dishwasher-safe! 10. An interactive cat toy that's simply purr-fect for entertaining your precious feline. 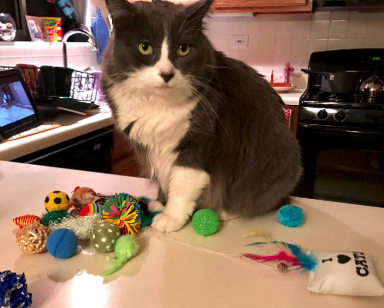 Put down the laser pointer and get your cat something you can play with together! This fun tower features multi-level tracks that will keep your kitty entertained for hours as they bat balls around. It's suitable for one or more cats and will help them have a more active lifestyle. AND think of all the great IG content you'll get! Get it from Amazon for $11.99 (available in orange, pink, and purple). 11. A dainty necklace featuring your pet's name and a paw print so you can keep them close to your heart at all times. You don't have to wait for your pet to be gone (LET'S NOT EVEN TALK ABOUT IT) to get a piece of jewelry in their honor. I would happily wear one of these precious pendants any time! You can customize the disk with whatever words you'd like and choose whether you want both sides engraved. There are a variety of font options and chain lengths available. Get it from DaniqueTrends on Etsy for $34.99+ (available in silver, gold, and rose gold). 12. A bed-warming mat to keep your little one comfortable and cozy at all times. 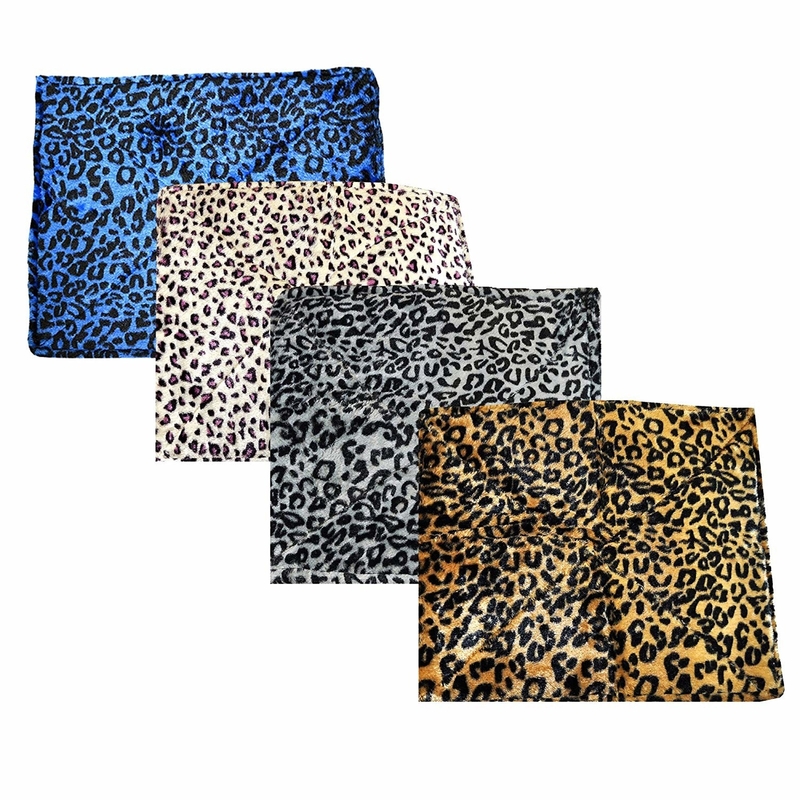 This thermal bed mat is ideal for both cats and dogs and comes in a bunch of fun patterns. It features a lightweight core that reflects the animal's body heat back to them, so you don't have to worry about wires and electricity. Get it from Amazon for $11.99+ (available in regular and large sizes and in four prints). 13. A big 'ol box of cat toys that you can use to shower your kitty in presents. Is it your cat's birthday? Or maybe you want to go all out for the holidays? 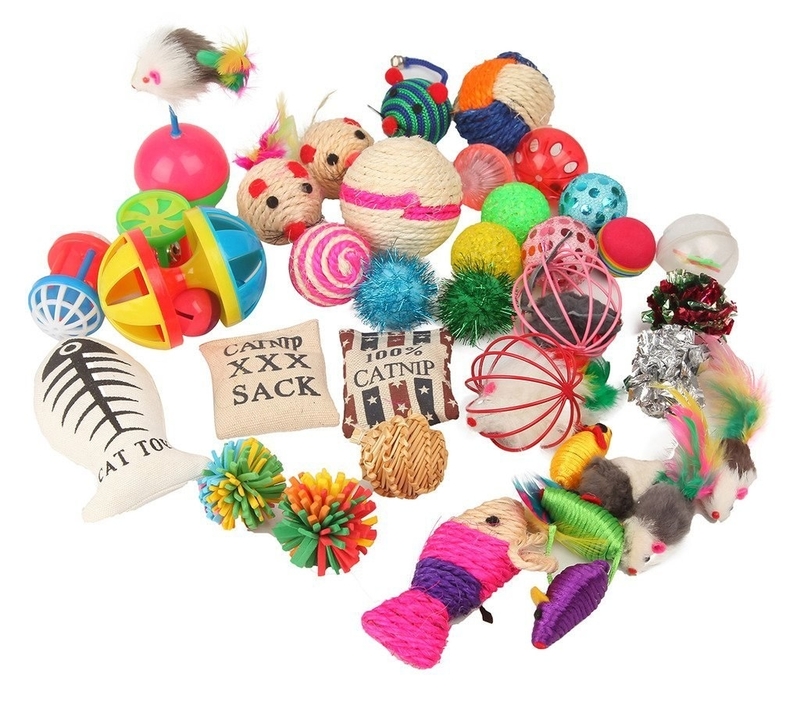 This affordable purchase comes with 20 toys for your cat to enjoy! 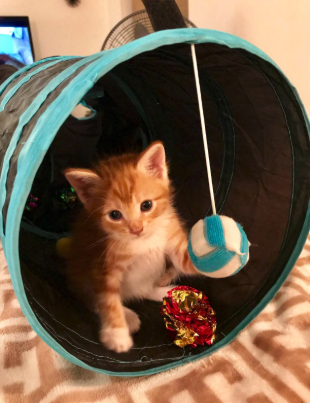 Pet lovers enjoy nothing more than watching their beloved react to a new toy — just think of all the fun you'll both have with this item! Get it from Amazon for $12.88. 14. A customized ornament to incorporate your love for your pet into your holiday decorations. One of my all time favorite Etsy purchases has been this custom ornament of my dog. I loved it so much, I've since ordered two more for friends and family members. The detail is incredible — it truly looks JUST like the photo I sent along. It makes me smile each year I hang it on our Christmas tree. Get it from Kreations4UbyKT on Etsy for $21.95 (available in gold and silver). 15. A waterproof coat that will keep your pup snug and dry when you venture out into the world. 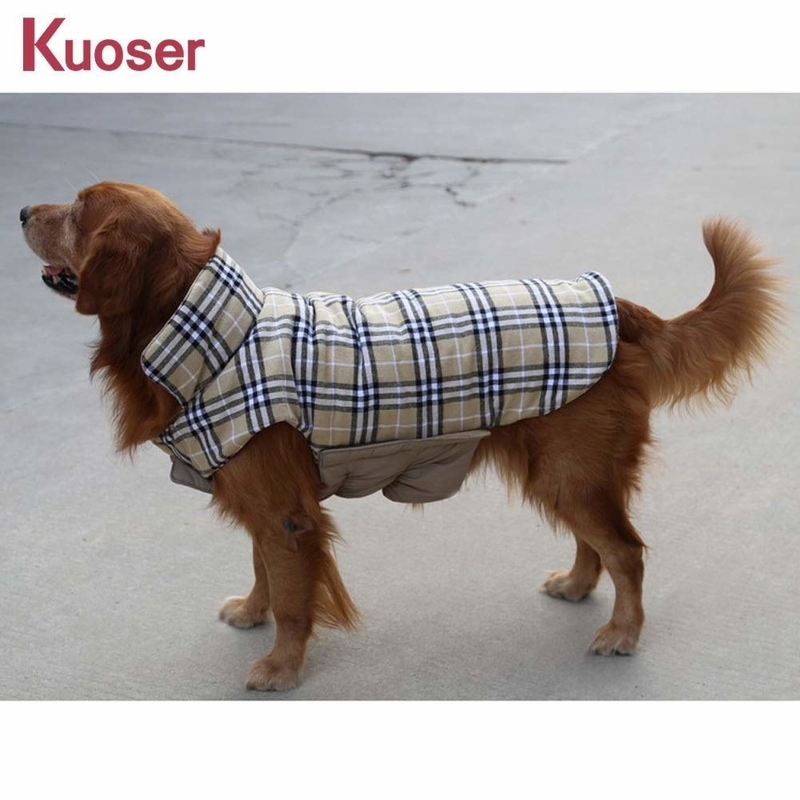 If you and your dog enjoy going on walks — rain or shine — then you definitely need this coat. 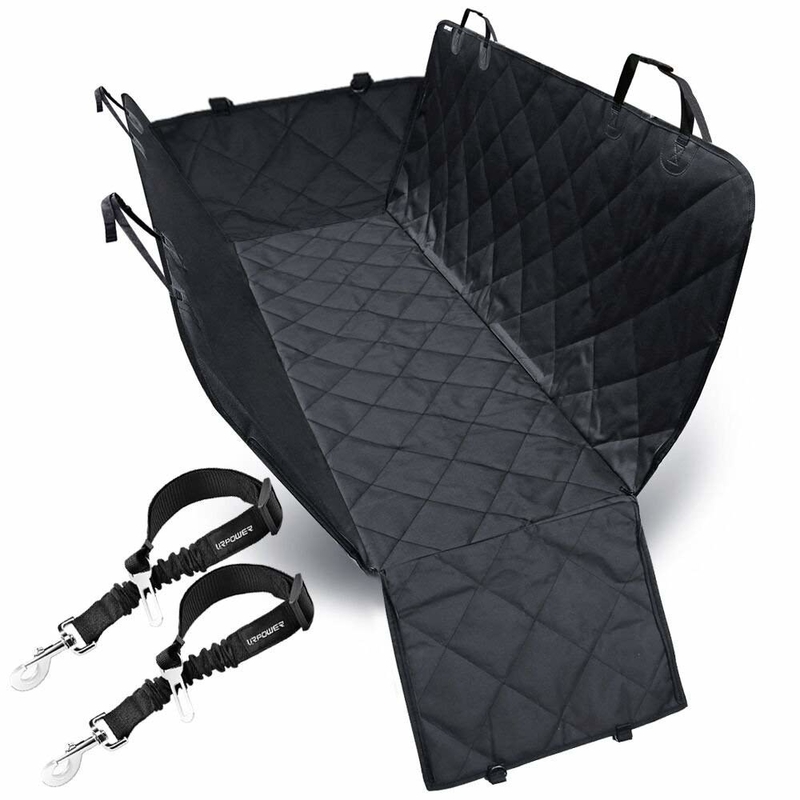 It will keep your pup dry and you won't have to spend time drying them off when you get back! 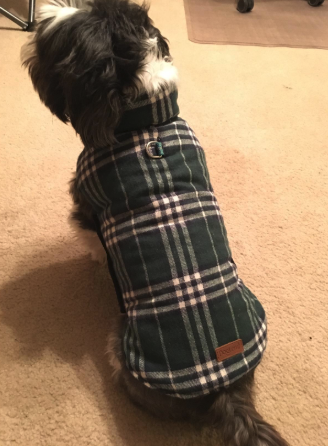 It's available for dogs of all sizes, is easy to put on, has a cozy warm fleece lining, is reversible, and honestly just looks super cute! Promising review: "A very well-made coat and very warm. My dog can move around freely in it. I have an 18 lb Shih Tzu and he fit perfectly in the medium. I haven't had any issues with it, and his harness clip can easily be accessed through the hole on the back." —Sean and Maureen C.
Get it from Amazon for $13.99+ (available in sizes XS-XXXL and in five colors). 16. A personalized placemat so your fur baby can eat dinner in style. My dog has a specific spot in my parents' kitchen where his bowls live. He lingers around there around dinner time and not-so-patiently waits to be fed. Why not jazz up your pet's special spot with a personalized placemat? With a ton of colors and font styles to choose from, you can really make this your own. Get it from SnappysBoutique on Etsy for $14.87 (available in many styles and colors). 17. 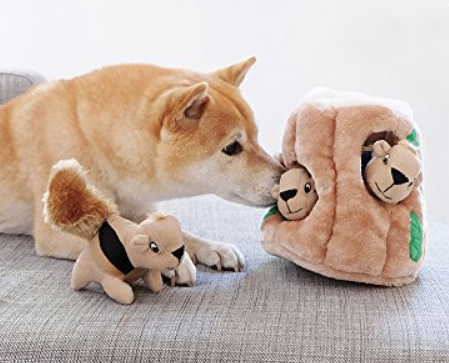 A squirrel-hiding toy that thousands of dogs are obsessed with — and yours will be too. If you haven't heard of this toy yet, prepare to be amazed. Essentially, it is a plush toy that features a log with three to six squeaky squirrels. Stuff those little guys inside the log and let your pup go to town trying to sniff 'em out! This is 100% the next thing I'm buying for my dog — it has 8,500+ positive reviews! It also comes in four different sizes so you can find the one that fits your dog best. Check out our full review here. 18. A swanky collar to introduce your pet to the finer things in life. Throw Fido's boring, old collar in the trash and spice things up with this custom-made creation! 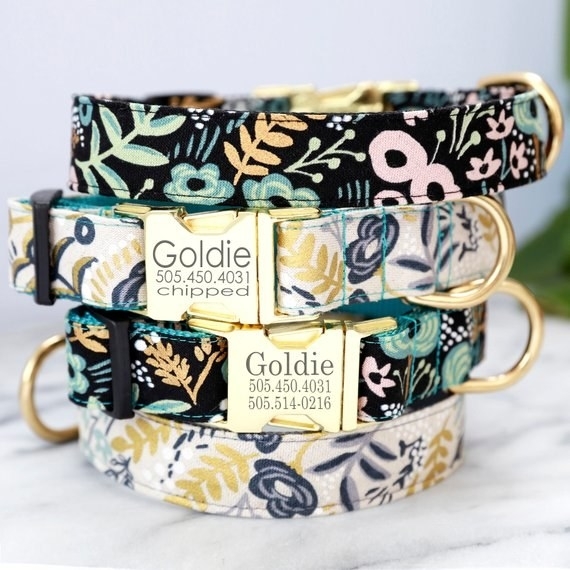 Available in a variety of fun colors, this collar features an engraved gold buckle that includes your pet's name and a phone number to contact you in case they get lost. 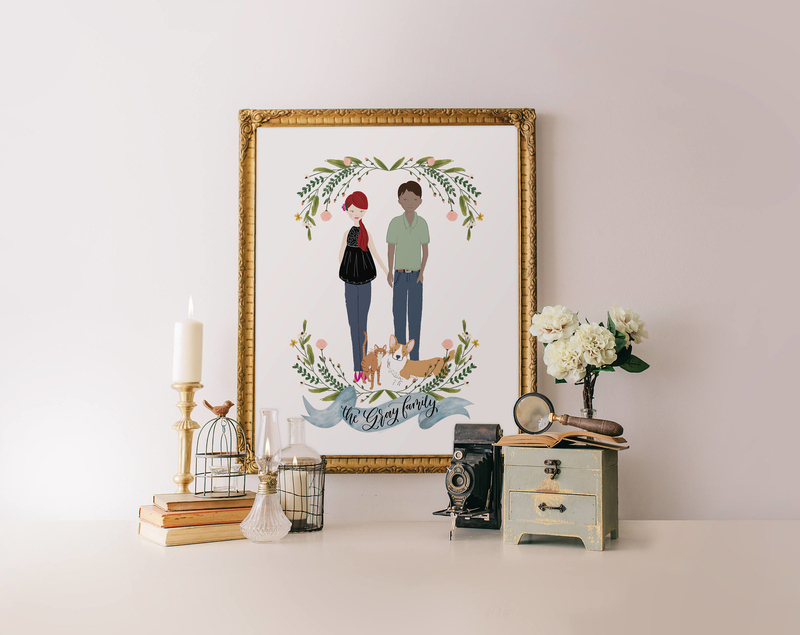 The prints are made from Rifle Paper Co. cotton canvas, which is said to be tough and washable (as well as gorgeous!). 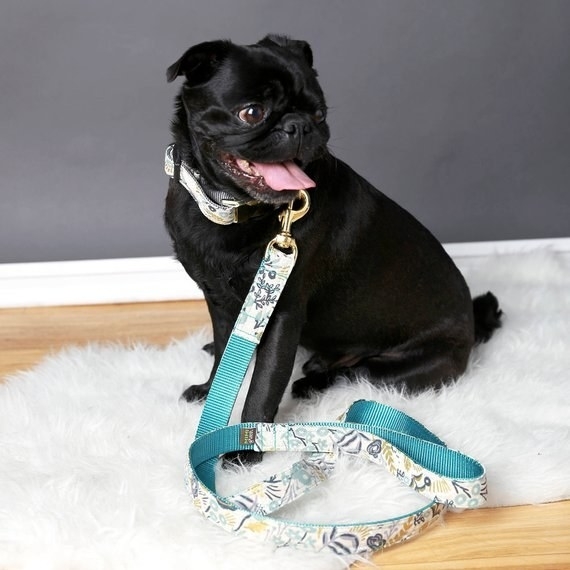 You can also purchase a matching leash. Get it from shopmimigreen on Etsy for $29.99+ (available in six sizes and 12 colors). 19. A fluffy pet blanket so your dog or cat can experience the utmost comfort at all times. More often than not, my dog is hiding in my parents' walk-in closet bundled up in a blanket of his choosing. And you know what? He (and all pets) deserves an upgrade, damnit! 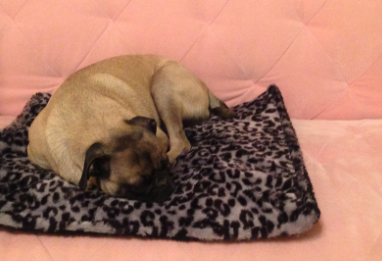 This blanket features a double thickness, so it is SUPER soft and excellent for making your pet comfortable. It's made of fleece and flannel, plus it's machine-washable! Get it from Amazon for $12.99+ (available in three sizes and in five colors). 20. A custom stuffed animal of your pet that is sure to become their (or your) new favorite toy. How AMAZING is this product? Petsies does an impeccable job creating a mini stuffed animal version of your pet. 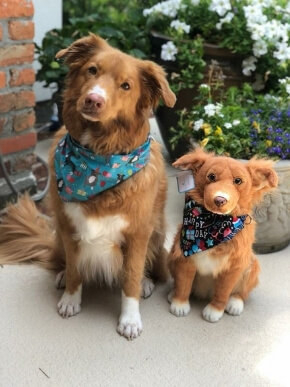 Perfect for someone who is separated from their fave buddy or for a pet that would simply enjoy having a toy that looks just like them, this company can create literally any pet you want (cat, dog, guinea pig, whatever)! 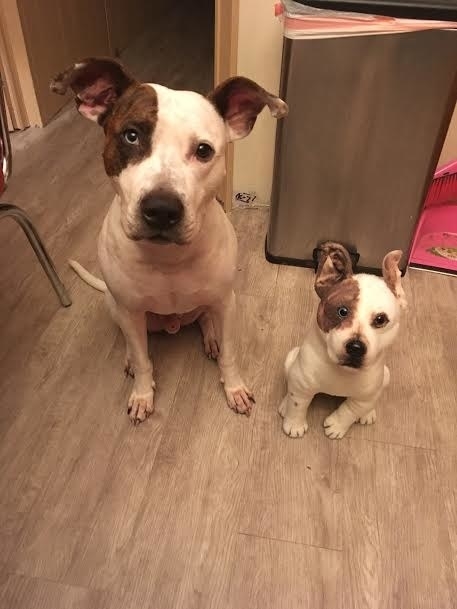 All you have to do is take a few photos of your furry friend (as if you don't already have 1,000 on your phone), submit 'em, and wait for their doppelganger to arrive at your doorstep. Get it from Petsies for $199 (originally $249). 21. And an adorable polo shirt for when your pet wants to look extra polished. 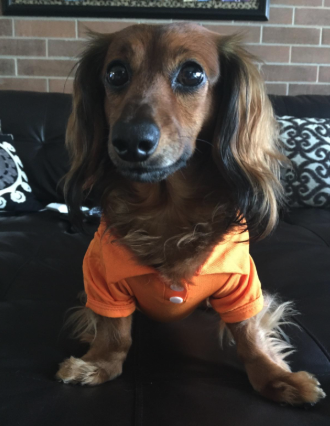 I don't know about you but I am straight up giggling looking at these photos of dogs in polo shirts — and I want to order one ASAP. 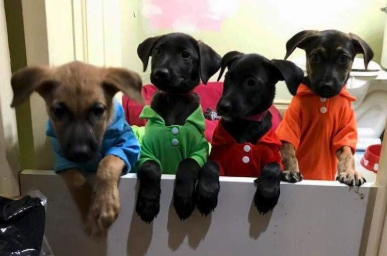 This set comes with four colorful polos that are made of cotton, so you know your pup will be comfortable. Just note that they are made for small dogs, despite the XL sizing option. Get it from Amazon for $11.99+ (available in sizes XS-XL). Hope you enjoy shopping for these paw-fect items! 29 Cool Pet Products That'll Make You Say, "Why Didn't I Buy This Sooner?"